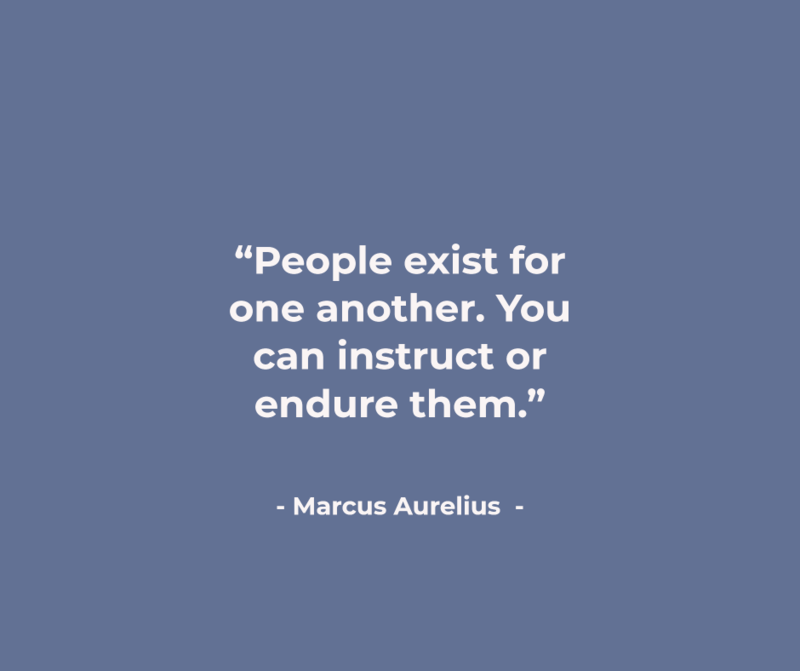 Marcus Aurelius was the Emperor of Ancient Rome between 161 and 180 AD. 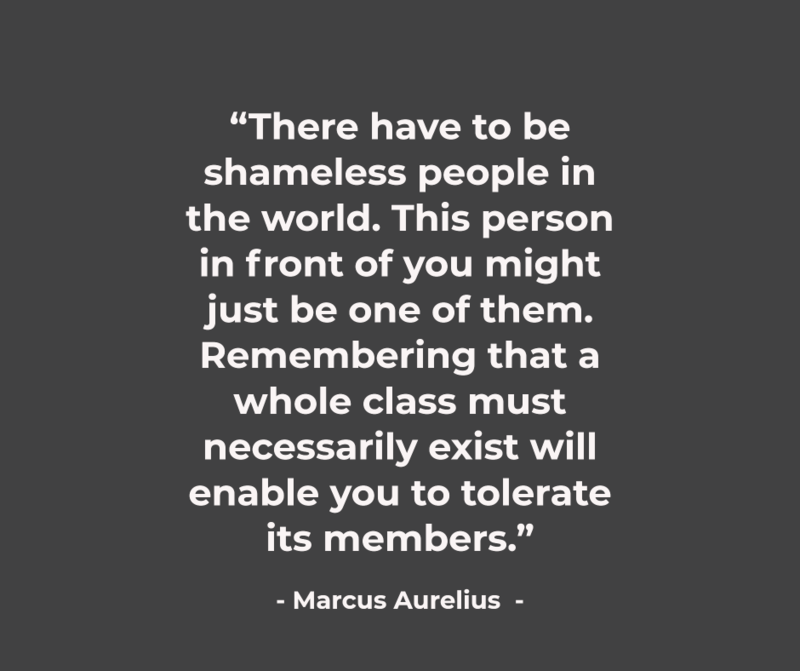 Known commonly as the last amongst the “Five Good Emperors”, Marcus Aurelius carried the Empire on his shoulders, keeping it from its inevitable downfall and witnessing the worst: a declining national health, a promiscuous wife, a treacherous civil war, the rise of Christianity, a plague wiping out his people by the hundreds, and threat of battle and instability from all corners of the Empire. Many in his position would have fallen to madness, under the stress that was his daily burden. 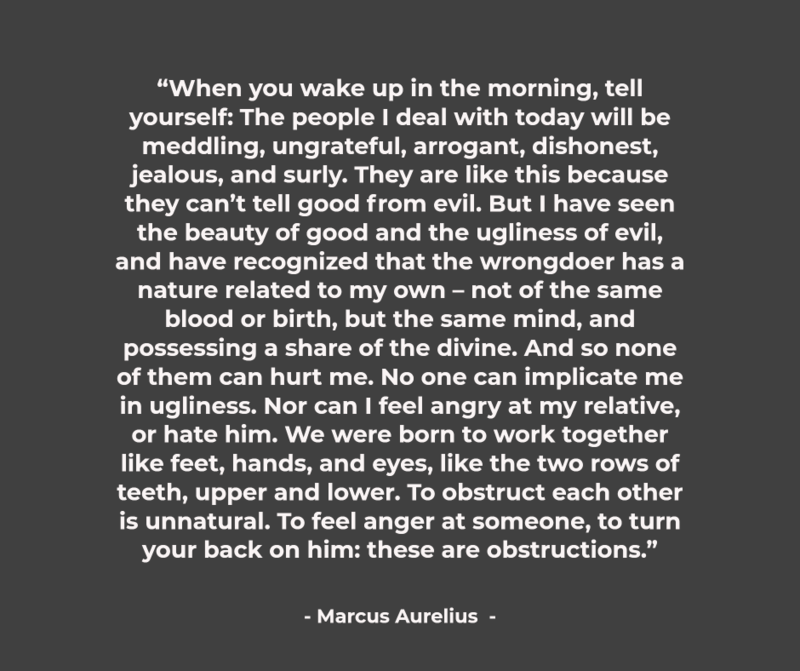 This and many other snippets of the brilliant stoicism that guided Aurelius’ nature can be found in Meditations. 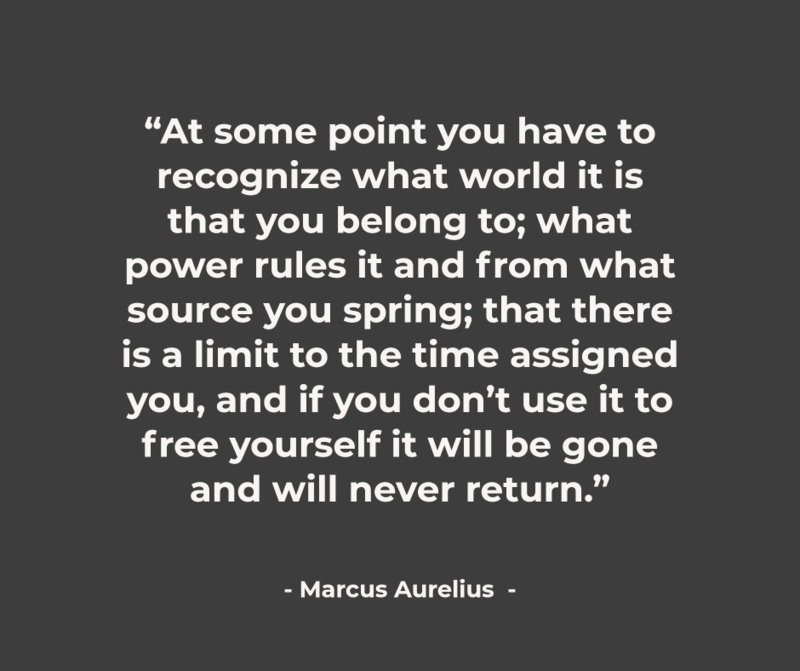 For many, Aurelius’ notebook is the definite guide on becoming the best version of yourself you can be—actualizing the greatness that rests within you and maximizing your own strength, humility, personal ethics, and self-discipline. 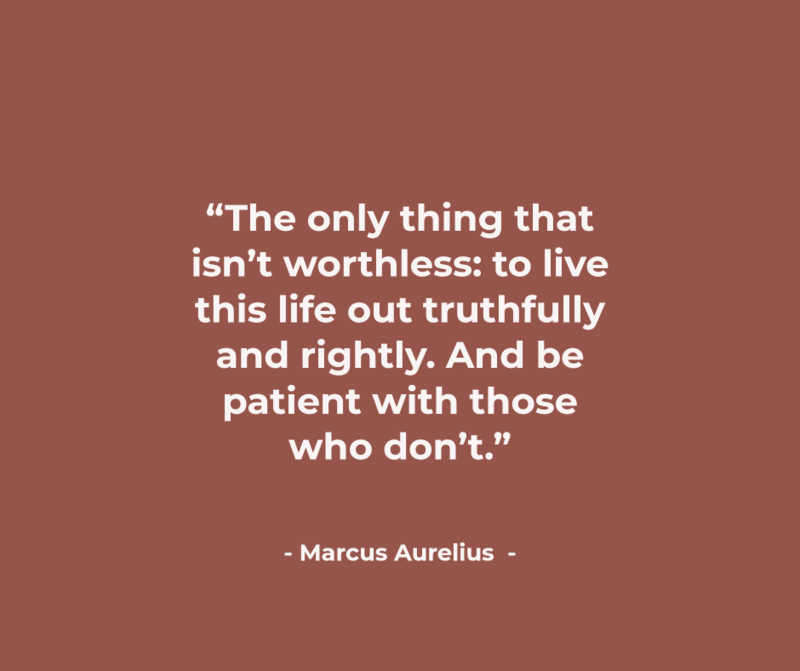 Here are 22 of the wisest stoic truths from Marcus Aurelius buried in his 2000-year old diary, which still resonate as true today. 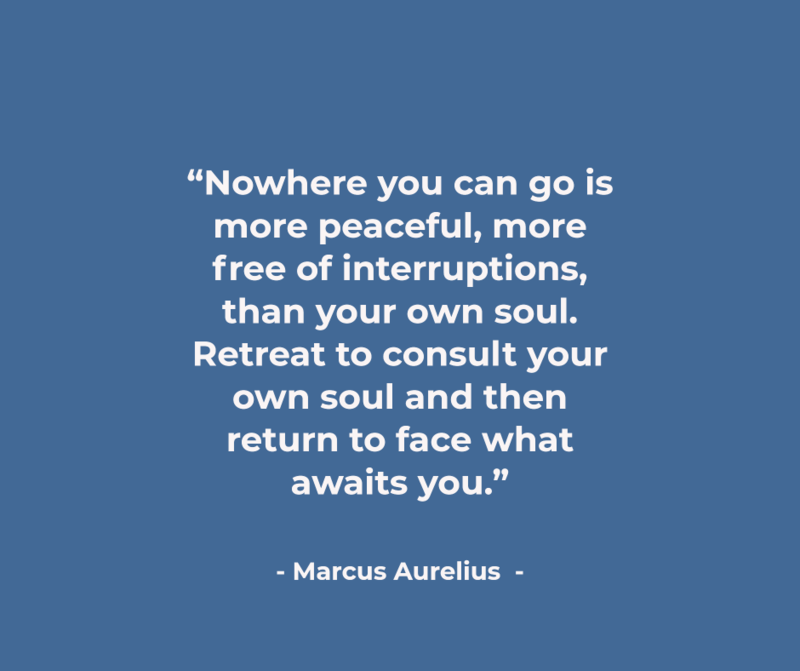 Stoicism regards the soul as the “inner citadel”. It teaches that the answer to your problems—even if your problem is the lack of direction—will always be found in your inner citadel, which is your own personal sanctum of peace. Think of your mind like a deep lake. No matter how much strife and chaos you are experiencing on the surface, there will always be stillness and silence at the very bottom, and this is where you will find your answer. In times of stress, reach within yourself and come out stronger. But who would want to live that kind of life? Hardship and pain are intertwined with living a life worth living. Stop searching for the impossible—a life without pain or sadness—and start pushing yourself to your goals. Have you actually pushed yourself? What part of it will be so difficult? What is the first step? How can I find motivation today? Once you start asking yourself the right questions, you will realize that you are much stronger than you believed. Never forget the strength within you. By bringing negativity onto others, you associate your own image with negativity, harming yourself in the process. Respect is a process that comes from the self, and by respecting yourself you will ultimately begin to respect others. 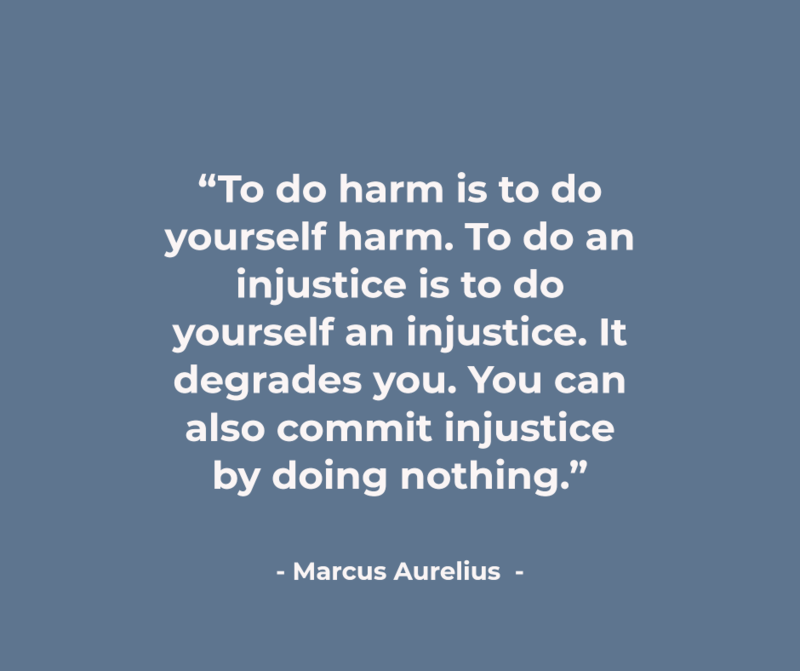 And finally, when others are suffering and you do nothing to help them, your own image is stained. We are all burdened with problems, hardships, and issues. But concerning yourself with solving the pain of everyone around you is a task that will take a century. 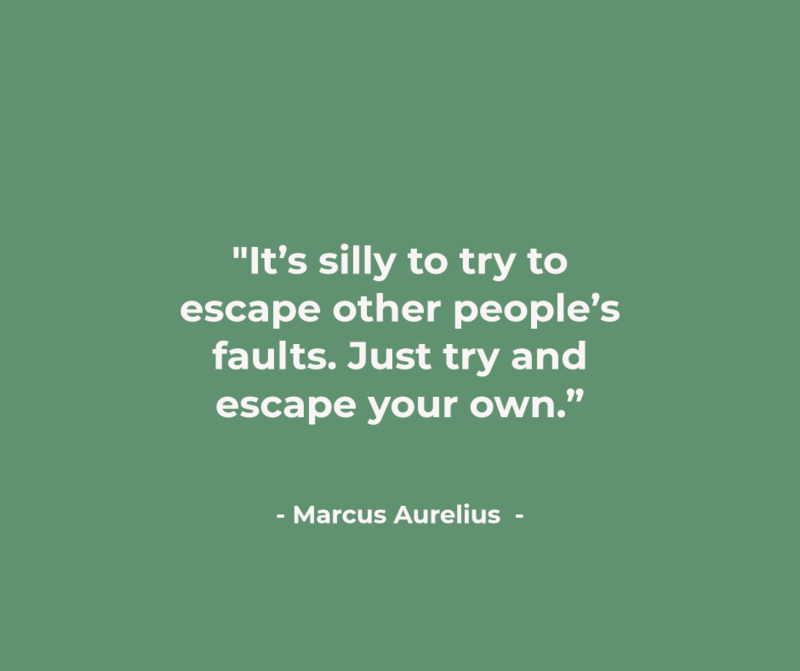 You can’t fix the faults of those around you, but you can fix your own issues. Work on yourself first; let others handle themselves. The fundamentals of existence remain true for everyone you see and interact with. We will all love, laugh, cry; we will all experience the deaths of those we hold most dear. It is not something that we can escape, and by realizing that we all share this humanity within us, you also realize that there is no need to disrespect or harm those around us. Find the inner peace and strength to treat those around you with nothing but kindness. When you encounter rude or mean people, stop being so shocked and surprised at their existence. Come to grips with the fact that there will always be mean people. The more we expect the inevitability of meeting rude, mean, and unkind souls, the less they will affect us. Do not let them draw you into their own personal hell by understanding that they exist. 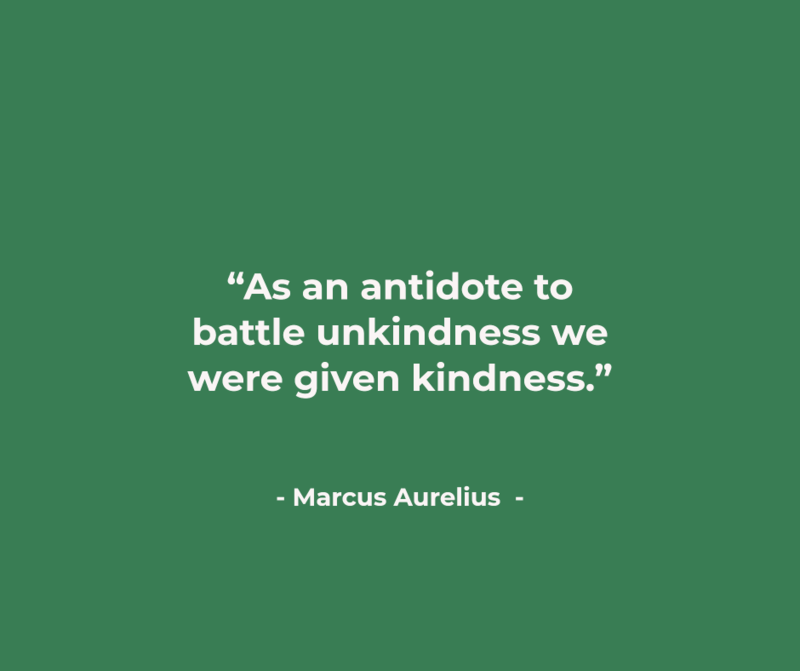 The most surprising thing you can do to an unkind person is to respond with kindness. They will have no idea how to respond themselves, because they have only known unkindness from those around them. Battle their rudeness with politeness, and you will disarm them more thoroughly than any insult could ever do. The way we feel is determined by the way we allow ourselves to feel. The power we have over our mind is insurmountable, if we make the most of it. If you are called a bad name, all you must do it have the power to disassociate yourself from that name or image, and you will find yourself unaffected. No matter how rude or ungrateful the people around you may be, remember that you have complete control over your actions and thoughts. To give yourself in to negativity is a failure of your own; the responsibility of your emotions rests in your hands and your hands alone. 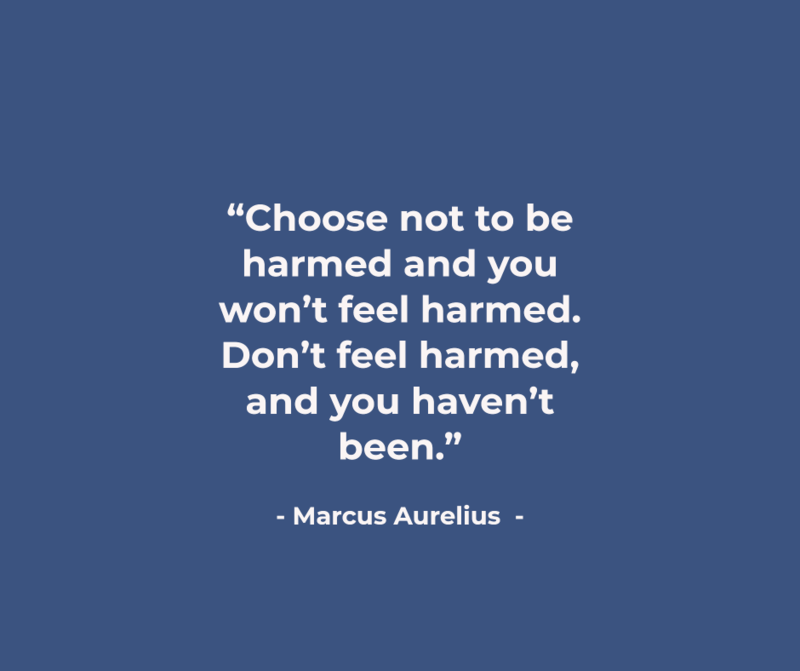 The proper stoic never lets another determine the way he or she feels. The only important value we can dedicate our lives to is to make sure we live it with virtue and kindness, rightfulness and truth. But while we may realize this, not everyone around us is mentally prepared for this realization. Don’t look down on them for this. Find patience in yourself to respect them and let them be who they are, until they come to the point where they can stand beside you. 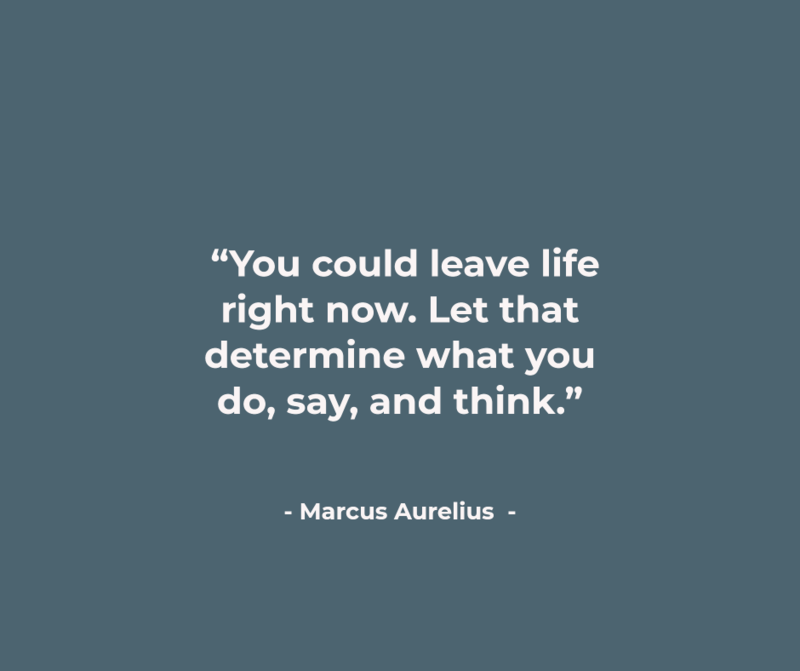 One of stoicism’s core beliefs is that death is something we should never concern ourselves with—the state of being alive means death is not our concern, and the state of being dead means we cannot be concerned. 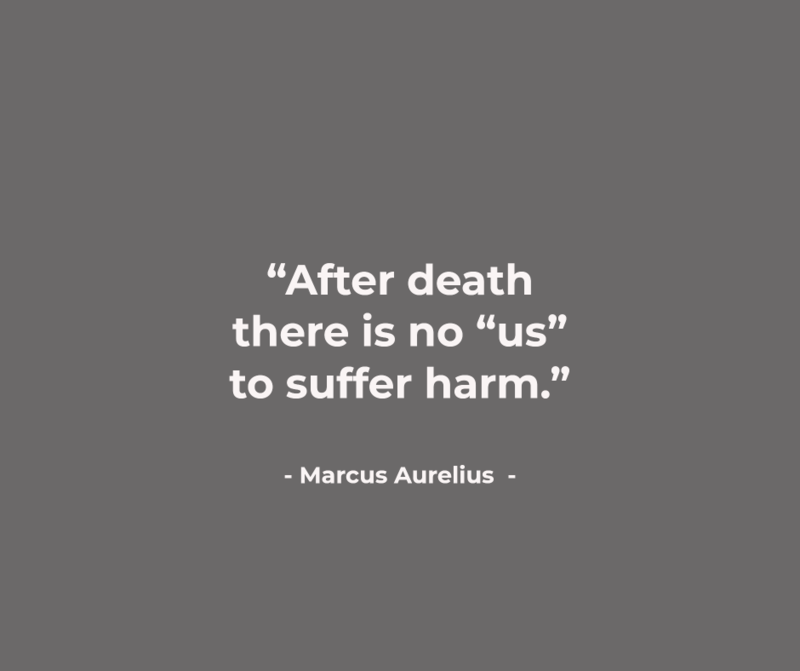 Death, therefore, cannot cause us any harm. 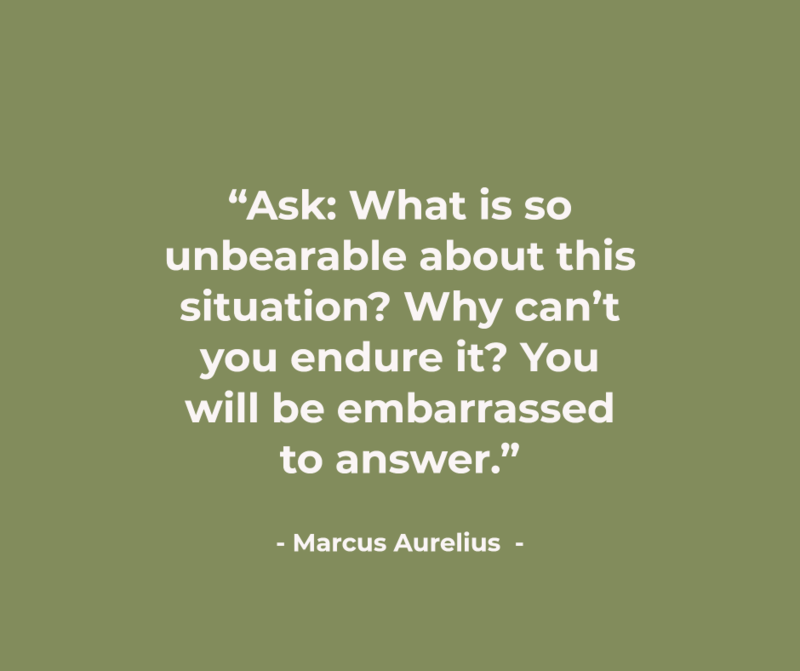 Aurelius himself has famously stated that within death is the end of fear. Before and after we die, we are just a part of the cosmos, substance like everything else in the universe. It is pointless, then, to react to our death negatively; simply we must embrace it, for it is our natural course as living things. We have our entire lives to prepare for the passage to nothingness. 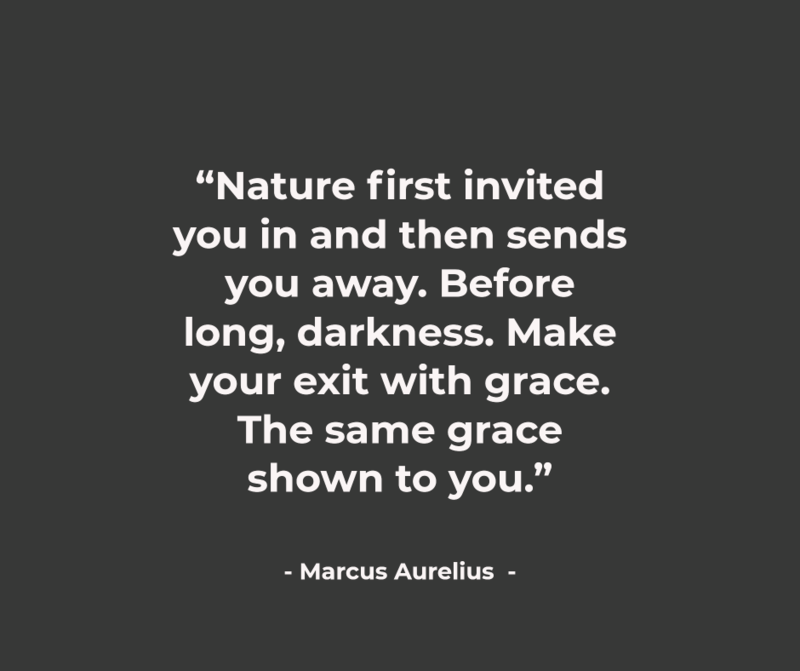 Have grace when we finally take pass through our final door, and back to where we began. 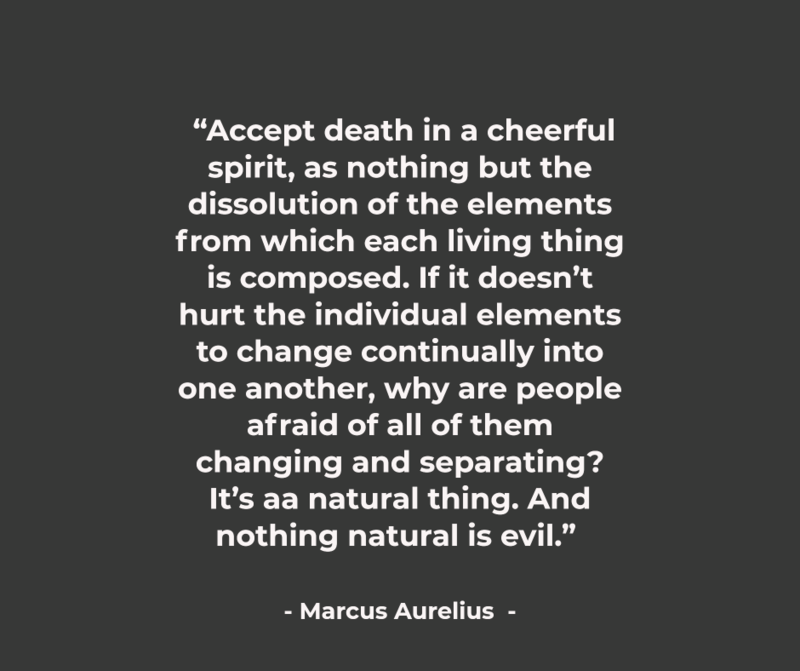 Death is a natural thing, therefore it cannot be evil. We should be cheerful when it comes, and it is nothing more than an act of physical change. We are never truly individual, as we are all parts of the universe working in harmony with the rest. Just the fact that we found consciousness or happiness for a single moment is enough to say that we experienced it forever. 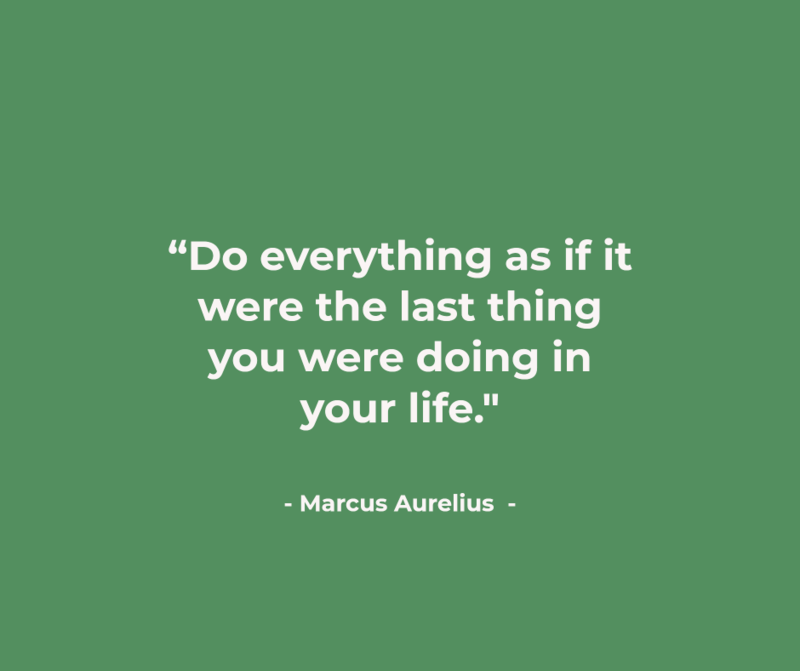 As they say, “Carpe diem”, or perhaps more recently, “You only live once.” There is no guarantee that you will spend another year, month, or day on this earth, so you should direct every action as if it were your last. Live in a way that you will never have to regret the manner in which your last day was spent. Live every day as a representation of the best part of what you can be. 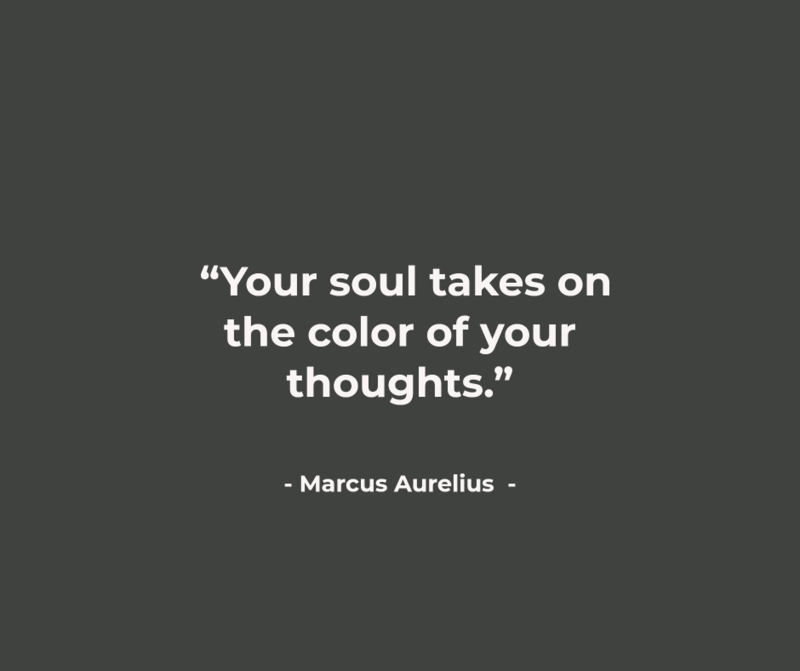 Many people undervalue how important our deepest thoughts can be. Our actions and words do not define who we are; it is our thoughts, the way we think and what we choose to think about. Who we are is most determined by what we think—the rest just falls into place. 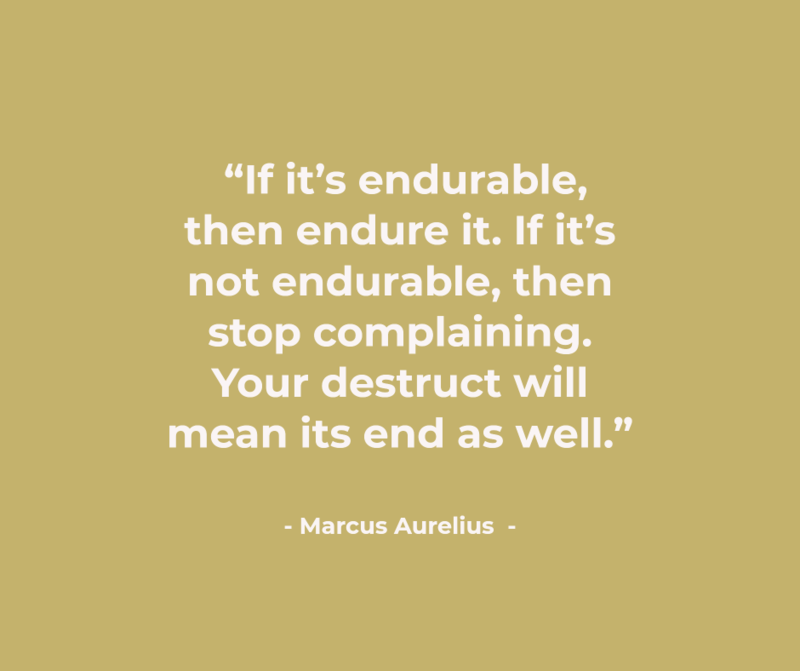 Pain and suffering is inevitable, and complaining about it does nothing but waste your own time. If it won’t kill you, then just know that it will pass. And if it will kill you, then find peace in the fact that your end will come with its own end. We cannot control the past or the future, but we can control the present. We can control our actions that happen right here, right now. If you fully embrace that your life happens in the present, then you will stop reminiscing the past or dreaming about the future; instead, you’ll start building in the present. And we want to be remembered the way we lived; if this were your last day on earth, would you be happy with the way they will remember you? It is so easy to daydream our lives away. To think that we have an endless amount of time to achieve our hopes and dreams, therefore we don’t have to take ourselves seriously in the present. But if you never stop yourself and force yourself to move forward, life will never take you to where you want to be. The end, death, is coming at us, slowly but surely, and every day we waste is another day we will never get back. When we experience giant tragedies in our lives, such as losing a job or promotion, we feel our entire emotional well-being go into a state of anarchy. 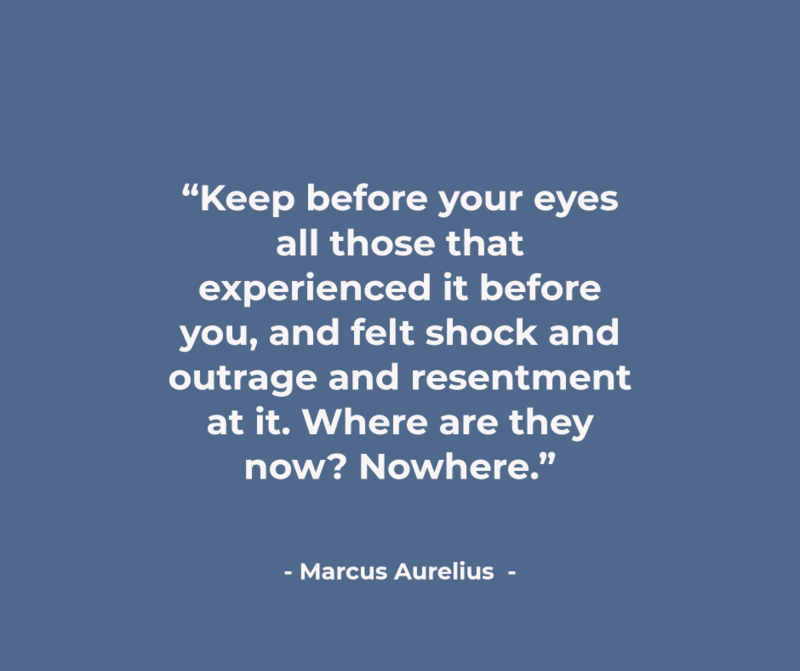 We feel sad, outraged, depressed, resentful, as if it is the worst thing that has ever happened. But remember: millions of people have experienced your own feelings, and they have met death, just as you someday will. Don’t let your life be ravaged by emotions that won’t matter at all in the grand scheme of things. We spend much of our lives searching for fame, in the hope that we will be immortal—in the minds of those that will remember and worship us. 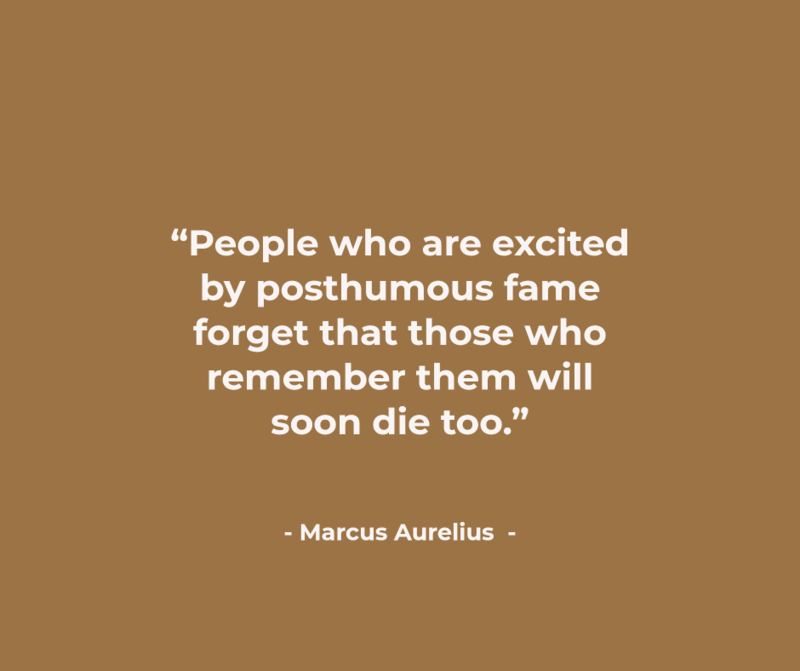 But we never acknowledge the fact that no matter how famous or successful we become, even those that remember us will someday die as well, and we will end up being forgotten, just like everyone else. So we must rule ourselves, not an empire, to live the greatest life we can live. 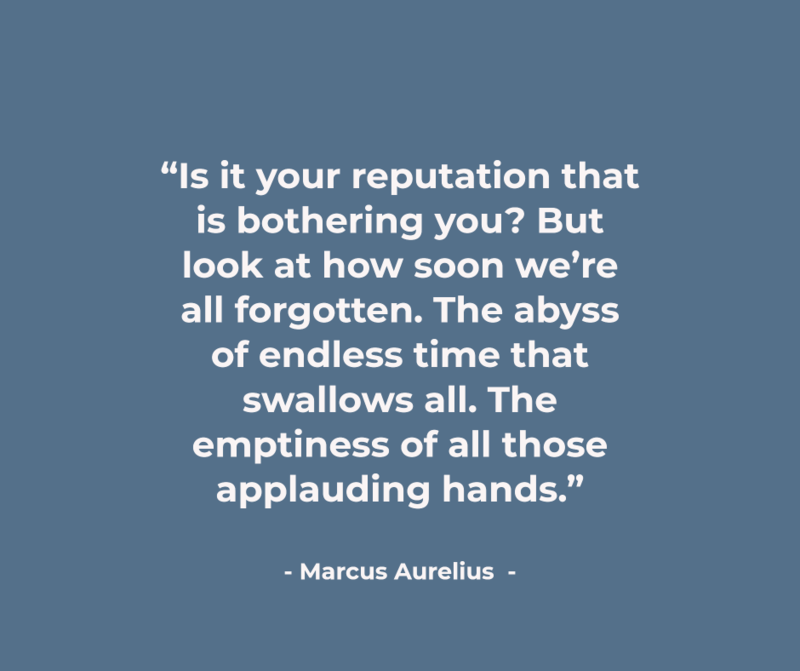 Aurelius wishes to remind us of our inevitable deaths. Our efforts, achievements, accomplishments—all these will end up being nothing someday. But this is not a negative belief; rather, it is positive, because it frees us from caring about what others think about what we do, and instead doing what most fulfills us. In the end, none of this will matter, so we should make the most of what we feel while we can. An excellent list, I wonder the kind of person he had in mind. Was it typical of his friends or family or who? Perhaps himself? If each of these could be delivered to each person in the world today that needs to accept the wisdom, would they be able to do so? I recently discovered a live webcam (Tropical Murphys that I mentioned in a post), and I see people of all types, workers, travelers, tourists, hungry, thirsty and have followed the whole day. It is an insight to people I have never seen; it is not my nature to sit and watch people for an extended time. I can guess that many I see may represent the demographics on which Ideapod is focusing. You did an excellent job of explaining what each of the 22 intended; I believe that people today should be educated sufficiently to understand from the original words. I am afraid our educational institutions are failing to deliver this skill. 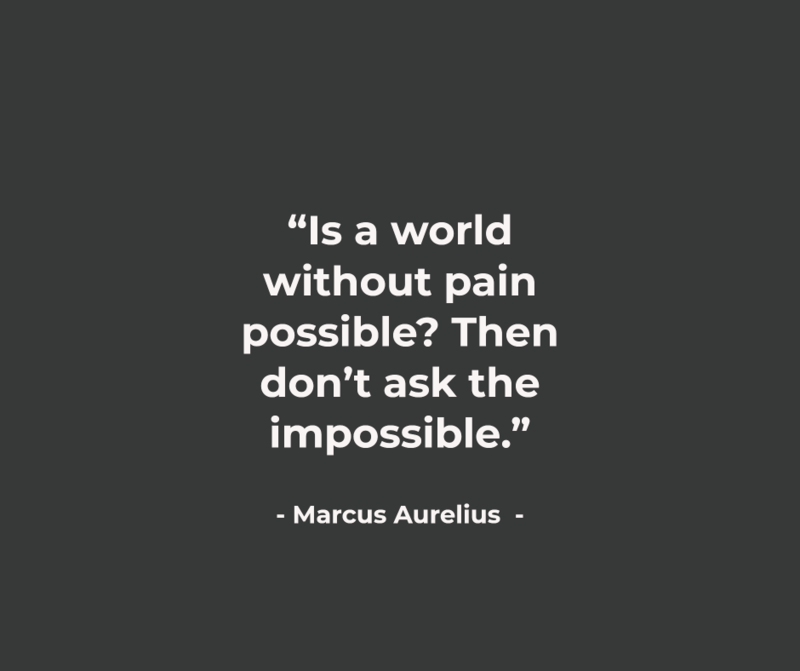 Stoicism is really an awesome philosophy to live by.